The focus of our efforts is on the future of the DRC, and much of this future lies with its children . . .
Our names are Geoff and CarolAnne Paynter and we live just outside the tiny township of Tasman, in the Nelson region. Geoff trained as a TV and Radio technician, but is currently working as a computer consultant in Motueka. Carol-Anne is completing her Masters in neuro-psychology and clinical psychology through Massey University. We were invited to go to the Democratic Republic of Congo in the middle of 2014, so we took up the offer and spent two months there. During that time we travelled around the Katanga Province (a region about twice the size of New Zealand), mainly observing what was being done by the Congolese people in the fields of medical care and education. We were staggered by the obstacles facing ordinary people in the DRC, especially those in rural areas (which make up 90% of the population). 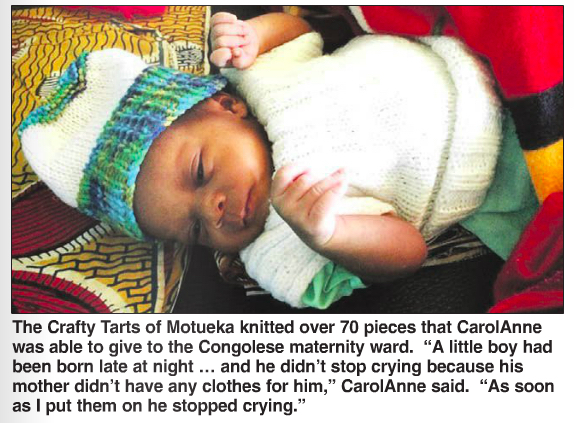 In most cases there were few options in regard to medical care, and little or no educational opportunities offered by the Congolese government. However, dedicated workers under the Mission Garenganze umbrella were helping those who desperately need it, both medially and educationally. We were deeply moved by the selfless service of doctors, teachers and administrators who were saving and changing lives with the most meagre of resources! It was this observation that led us to partner with these folk to make a difference going forward. Our main objective is to partner directly with strategic Congolese people on the "coal face" in DRC — people who are honest, hardworking, and seeking to serve others in the areas of medical care and education. One of the highest infant/child mortality rates ranging from 20-45% for children under the age of 5. Approx. 25% of children are malnourished. Average lifespan is 47-51 years. Less than ½ the population has access to clean drinking water and less than a 1/3 have access to adequate sanitation facilities. 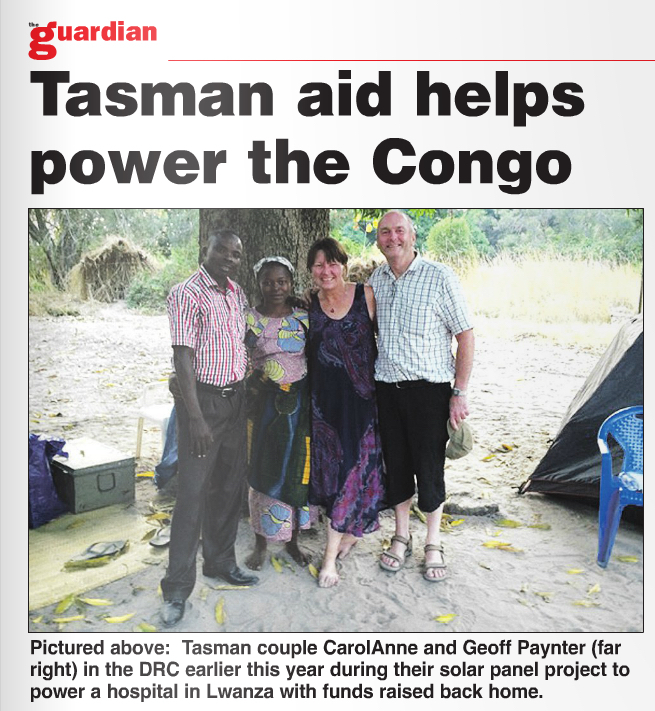 ​Democratic Republic of the Congo (DRC) might not be the first place you’d imagine local raised funds may impact, but that’s just where CarolAnne and Geoff Paynter have made a lasting mark with the help of generous Tasman locals. The DRC has the potential to be one of the richest nations due to its abundant mineral wealth, yet it is one of the least developed nations in the world lacking the infrastructure to meet even the most basic of human needs. That’s where the Tasman community has added value this past year, helping in what may seem a relatively simple but profound way, by installing solar panels to ensure electricity in a hospital based in Lwanza through a project in conjunction with Mission Garenganze. The Congolese locals were overjoyed when they first saw the light powered by the solar panels CarolAnne said, with one of the main doctors’ incredulous that the power would last through the day and into the night, something he would not believe until he saw it for himself. We don’t necessarily understand it because we have power all the time she said, but in the DRC where there was not sufficient light for even basic surgeries, it was a lifesaving change. “The lighting beforehand was pathetic … it was so bad we sometimes had to move the operating table over to a window so that they could get better light. “At night, which a lot of the time is when babies decided to be born, the doctors have to emergency Caesarean Sections and actually use the light in their cellphones to deliver by. In addition to basic needs they also focus on education by equipping and passing on resources through training, with the locals then integrating it into their life, all made possible by a those who chose to give a little.